Tokai Forum - a subsidiary of TokaiRegistry.com :: View topic - Earthing a JB45? Posted: Fri Aug 05, 2011 6:25 am Post subject: Earthing a JB45? Having now lived with my JB45 for a while I want to do something about the exsessive hum. I notice from pics on other posting that Tokai JB's don't seem to have a connection to the earth pin on the jack socket or any earthing to the pots. I rewired my bass exactly as it was but I can't believe it would have had quite this much hum when built. Touching the jack plug takes the hum away completely so I am sure it is an earth issue. 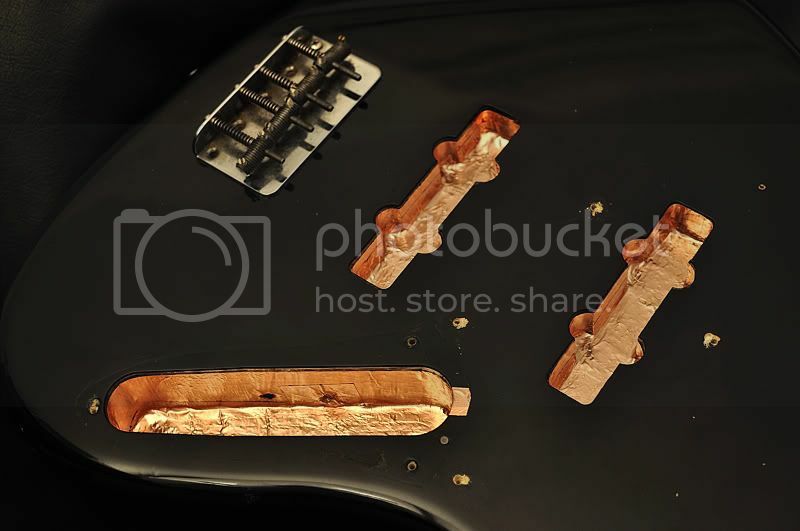 The bridge is earthed to the brass cavity plate and there are also earth wires coming from the pickup wire holes in the cavity which also go to the brass plate. Should I run an earth from the plate to the jack socket. It didn't have one when I got it and like I say other pics I find on here also don't seem to have one. Sorry if that doesn't make sense. By thge way, this is the thread I did about my bass while I was working on it. Sorted it. I ran a wire from the brass plate to the Jack Socket and now the hum (buzz) has gone. However I am still puzzled as to why the volume drops noticeably when both pickups are turned to full volume. Anyone know why that might be? If the humming bothers you (as it did me), your best bet is to shield all of the cavities with copper foil . I've done both of my Jazz Sounds (as well as all of my other basses, including the StingRay with the 'humbucker' pickup ). You just have to make sure that the shielding in each cavity is properly connected to every other cavity and grounded (via either the bridge or the chrome control plate) and then the background hum just disappears. I'm not kidding - my basses are now, to all intents and purposes, silent (when they're supposed to be ) and sound just as clear and bell-like as they did before. In my opinion, this is the best cheap upgrade that you can make to any guitar and is way better than killing the tone by changing to mud-bucker pickups! If you spend thousands on a 'boutique' bass, you usually get great shielding as standard, but for the manufacturers of 'standard' basses, the work involved represents a scary percentage increase on the price tag, which is why even the mighty Fender corp. don't bother to do shield cavities on their 'normal' basses, IMO. Get yourself some self-adhesive copper foil from ebay and give it a go - you won't regret it !